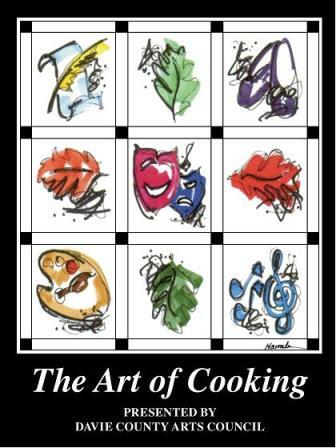 You can help the arts council in its mission to “Connect PEOPLE to the ARTS!” by purchasing our 40th Anniversary Celebration Cookbook! This book includes recipes from members of our community and also displays the works of some local artists! This is our fundraiser this year, so give us a call or come by and purchase your copy today at the Box office. Cost is $19, which includes tax. This cookbook will be a great addition to your culinary library, but also makes a great wedding, bridal shower or birthday gift! Ensure that our children will experience the arts through programs offered by our Arts in Education programming. Bring rich, varied arts programming to our community for the benefit of all. Provide “connections” to the arts for many years to come. Through your support we can make certain that the arts thrive in and around our community and that we can look forward to new possibilities as we continue our mission in Davie County. Your generous contributions in funds–and your time, as a volunteer–are more appreciated than you know. We need YOU! !